2018 / 2019 Season Registration now open!! Registration Cut-off 11:59pm September 30th! Any registrations after September 30th will be placed on a wait list. In order to register you must pay by credit card. If you do not wish to pay by credit card, the league will accept cheque payments with a $25 processing fee. To pay by cheque send your cheque in the amount of of the fee for the division you are registering for, plus $25, to the league with a contact e-mail. Once we have processed your payment we will issue a registration coupon so that you can register your child online and apply the coupon for payment. If you register your child and do not pay, they cannot be placed on a team! Any division show in red indicates the division is currently full. E-mail registration@rcfha.org to be put on a wait list in case a spot becomes available. ALERT: We have modified our Saturday schedule for kids grades K – 5 to avoid conflicts with Richmond Soccer. Games now start @13:30! All playing times/days are subject to change. See the Schedules page for current times for each division as they can change from year to year. Teams playing Sunday will be rotated through the early morning slots. Divisions may be combined or re-aligned by ages other than listed above to adjust for registration numbers. We cannot tell you what day/time/school your team will practice as the coach will request the gym that works for their schedule from the gyms we are given by the school district. We can tell you that practices will only be on Tuesdays or Wednesdays. PRACTICE DAY IS NOT GUARANTEED! RCFHA will provide a refund less $25 processing fee up until such time as the teams are finalized (usually by the first week of October). Once players are placed on a team, no refunds will be offered. 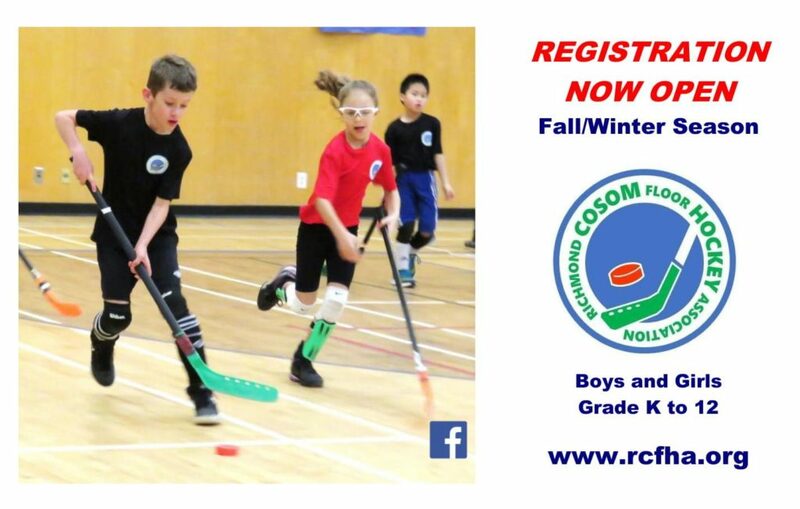 We are very pleased to now offer Cosom Hockey for kids aged 5+! Note that depending on registration numbers, K/1 players will either play with 2/3 players or have its own division. The Grad Division is for players 18+. Starting this season jerseys will be included but there are no practices or team photos for this division! I am trying to register my son to the new fiscal year 17/18, but it seems like there is an error with year of birth in the divisional table. What sort of error are you getting? Can you confirm your child’s birth year?